The Honda XR600R is hardly the sort of bike you could classify as refined. A big plastic drenched thumper, it’s design aims for function over form. That’s not to say that can’t be changed though, with the big single making a great platform for a custom build. 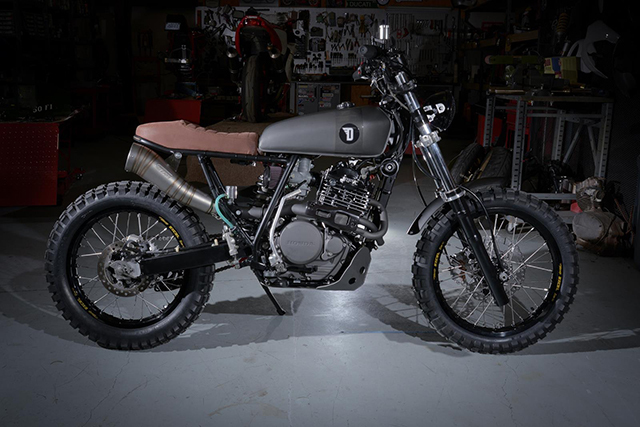 This is exactly what Moto Motivo has done with their latest commissioned build, taking a 1993 XR600R and making it ‘stand out in a sea of XR builds’. 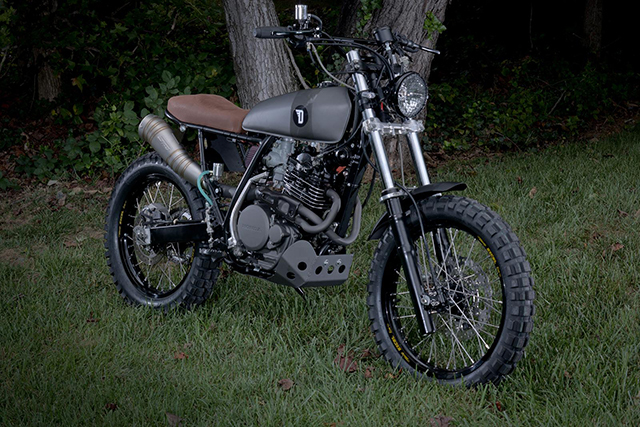 Looking very naked, this decluttered XR was built for Greg Hochreiter, the founder of Devolve Moto, a moto lifestyle shop based in Raleigh, North Carolina. 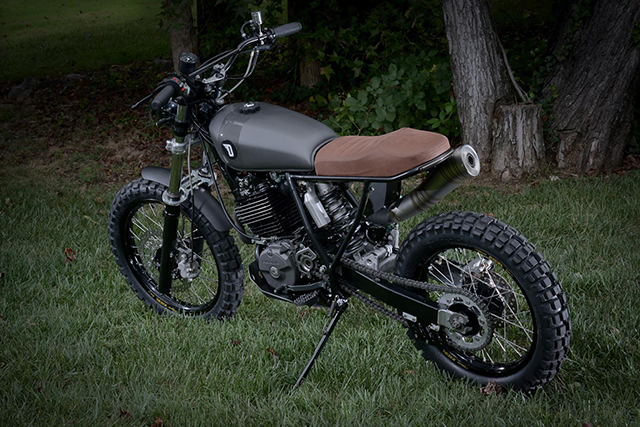 Conceived with the idea of using the machine as a daily rider, Moto Motivo has ensured the Honda retains it’s utility, while making it look a whole lot prettier than it did in it’s polyethylene cloaked factory guise. 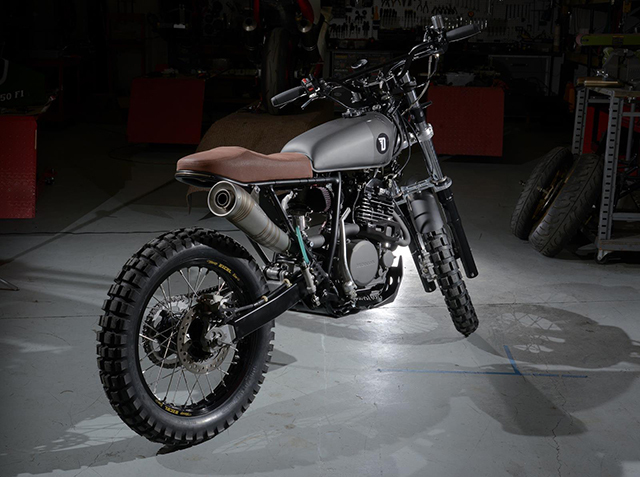 With Greg spending a lifetime on Honda bikes, the shop owner knew what make of bike he wanted to use in the build, and an idea of what the final product should look like. Taking a fancy to the XR600R model after seeing them in action in the Baja 1000, Greg was ‘blown away by how technically savvy the design was, from the RFVC, to the fully adjustable suspension and kick start only option’. Ultimately, the build brief was to create a bike that could go curb jumping on weekdays to get to work, then to be able to explore any fire trails that Greg comes across on the weekend. Approaching Moto Motivo, who are known for their credibility in the custom bike game, this is a different take for a workshop known for their cafe racer and naked bike builds. 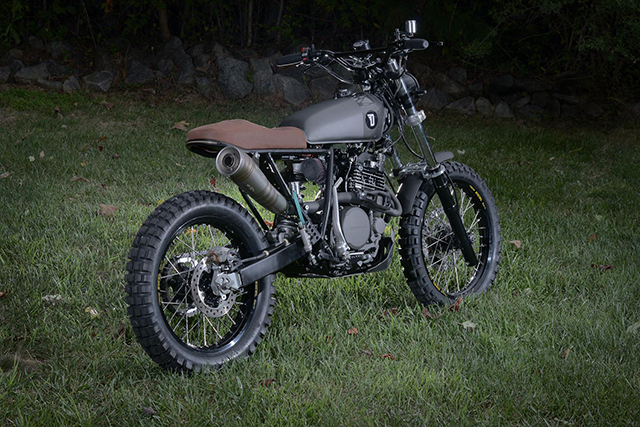 The final result is worth the gamble though, showing that Moto Motivo can take any type of bike and build it well. Taking the bike back to bare bones, the word of the day was ‘minimalism’. 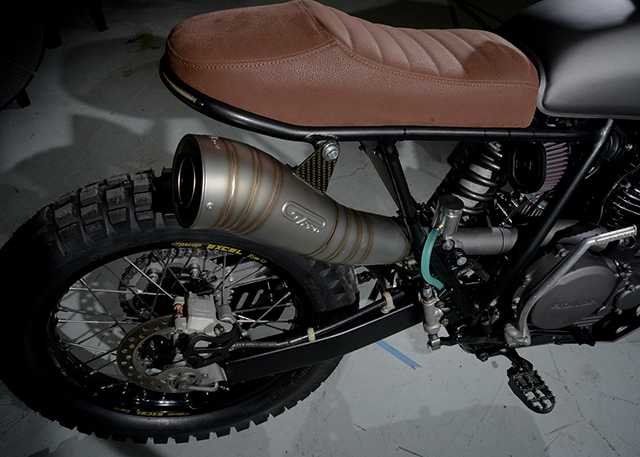 The rear seat frame was ditched and replaced with a Dime city cycles loop, a custom seat cushion manufactured inhouse at Moto Motivo. Gone is the bulky factory tank, in it’s place is a CG125 tank, chosen to narrow the bike to ‘comically skinny’ dimensions. While the frame was stripped, a new wiring harness was manufactured, in order to allow for more electrical options like high beam, turn signals and a charging system for the AntiGravity battery now fitted. Casting a glance over the bike you can see it is peppered with ceramic coated componentry, the first time Moto Motivo has used it on a build. 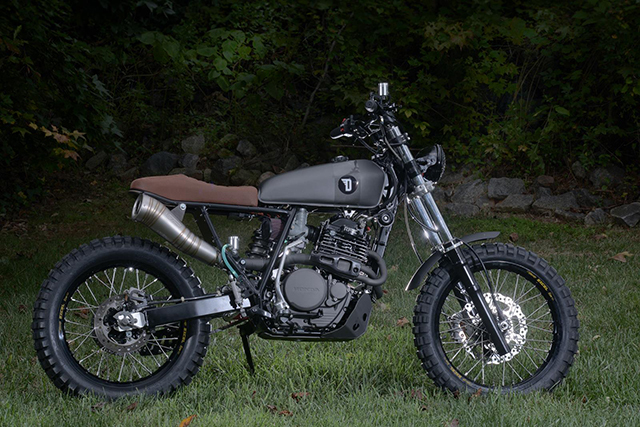 This helps for when Greg takes the bike off road, the firearm silver ceramic coating more likely to stand up to rocks and road debris than a regular paint job – plus it looks damn good. While on the subject of offroading, the suspension has been given the Moto Motivo treatment to help with the bike’s use as a daily rider, as well as to help it tackle the trails. The factory front forks have been retained, although they sit a bit lower than they did from the factory, and have been fitted up with a 280mm EBC brake rotor. At the rear sits an Eibach shock, featuring a lowering link to change the ride properties of the superleggera machine. Rims chosen for the build are Excel Takasago products, wrapped in Cinti TKC80 Twinduro rubber. In order to retain that reliability the XR600R is known for, the engine was not modified during the build. The carb is stock, the air filter is now K&N, but it all exhales through that work of art Leo Vince exhaust, hugging the frame and pointing skyward. Performance of the stock XR powerplant is more than adequate with the Leo Vince exhaust fitted, according to Greg: ‘It sounds like a machine gun from the future and is honestly one of the most fun bikes I’ve ever had the privilege of riding. Being able to pop a wheelie just by goosing the throttle is pretty damn cool too’. 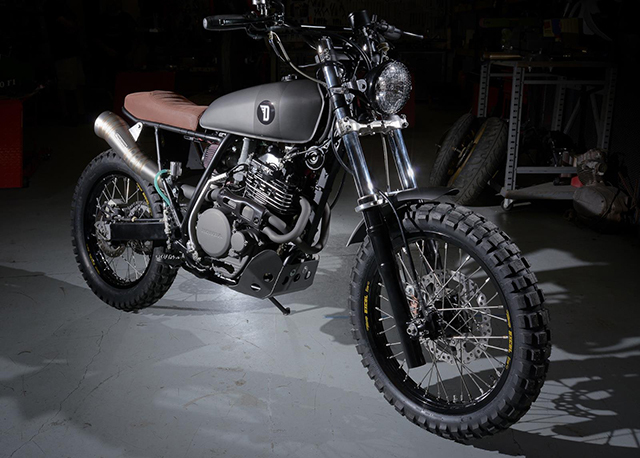 The first bike created in a series of custom builds for the Devolve Moto shop, the use of an XR as the platform for the custom has paid off. 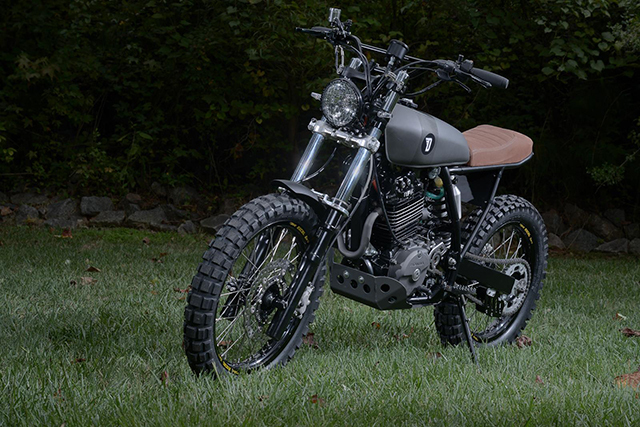 Ticking the boxes for reliability, useability, and likeability, Moto Motivo has created yet another sweet ride and we can’t wait to see what they come up with next.